Coming out of the foothills of the Tennessee River in the northeastern corner of the State, U.S. Highway 45 follows the general route of the Union troops in their advance on Corinth after the great Battle of Shiloh. Dropping out of the foothills at Tupelo, the route traverses the rich Black Prairie Belt, formerly one of the richest cotton growing sections of the State but now concentrated in diversified farming and dairying. In the center of this fertile region are the historic and beautiful towns of Aberdeen and Columbus, both of which sponsor annual pilgrimages for the benefit of downsouth travelers. Below Columbus the route enters the red clay, pine-covered hills, where is located the important industrial city of Meridian, second largest city in the State. 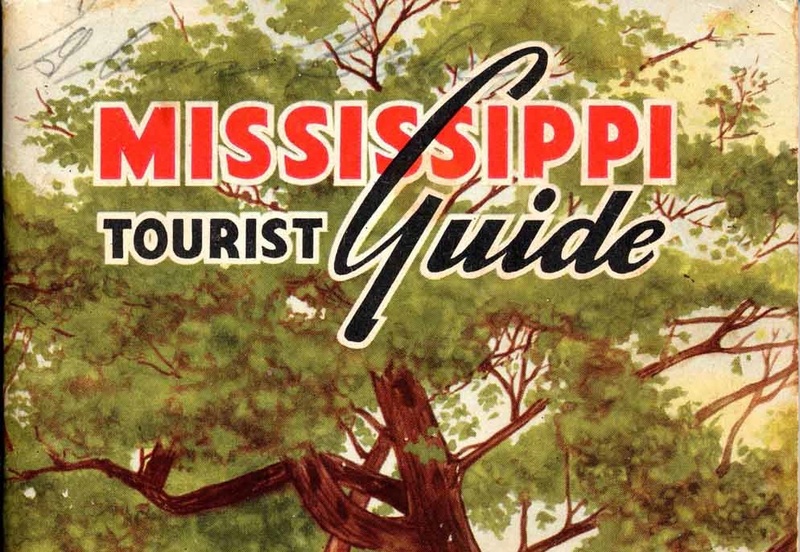 Winding in and out of the forested hills below Meridian, U.S. 45 carries the tourist through a typical Mississippi rural area of small farms and woodlands. Just below Waynesboro the highway cuts into the State line. Corinth, first Mississippi town touched by U.S. 45 as it comes out of the Tennessee hills, is a community with a glorious past and a promising future. As the scene of an important engagement in the War Between the States, Corinth has much in the way of historic lore to attract the visitor to this section of the State. Booneville, just below Corinth, was also a battleground for the Union and Confederate forces. Booneville Lake and Walden Lake are favorite picnicking spots in this area. Tupelo, next stop for the highway, is probably Mississippi’s best example of the New South” of diversified farming and industry. Leaving Tupelo, U.S. 45 enters the Black Prairie Belt at the small town of Shannon. From here Highway 45-W (Miss.) heads nearly due south to Okolona, West Point, Mayhew and Brooksville where it rejoins Highway 45 (U.S.). Aberdeen, first of the prosperous Black Prairie towns on Highway 45-E (U.S.), is located on the west bank of the Tombigbee River and was once a loading center for the river steamers. Aberdeen has lost little of its prosperity it experienced as an ante-bellum town. An annual pilgrimage, that finds many of the colonial homes opened to visitors, is sponsored each year. Columbus, 27 miles south of Aberdeen, is situated on high bluffs overlooking the Tombigbee River. This aristocratic town is famous for its beautiful shaded streets and historic homes. Recently, Columbus has followed the example of other Mississippi towns in opening its ante-bellum homes to visitors during an annual pilgrimage. Mississippi State College for Women is located here. In the spring Columbus is made even more beautiful by a profusion of purple wisteria blooms. Brooksville, where U.S. 45-E and 45-W (Miss.) become U.S. 45, and Macon, due south of Columbus, are typical of the quiet and prosperous Black Prairie towns with a picturesque past. Raising splendid show horses is the hobby of the large planters in these towns. Leaving the Black Prairie region, U.S. 45 enters Meridian, second largest city in the State, and junctions here with U.S. Highway 80 and U.S. Highway 11. As an important railway and highway junction point, Meridian has developed a thriving industrial economy. A modern country club with swimming pool and golf course and the beautiful Highland Park are favorite recreational spots. Key Aviation Field at Meridian is where the two Key brothers broke the official world’s endurance flight record in 1935. Meridian’s historical interest lies in the fact that it was completely “destroyed” by General Sherman in his march across the South states. Interesting landmarks remain to retell the tragic story of the Union General’s conquest of this area. Between Meridian and Quitman is Clarkco State Park, a 750 acre tract of woodland country with excellent cabin accommodations and recreational opportunities for travelers of U.S. 45. At Waynesboro, where the hills blend into the Piney Woods, U.S. 45 junctions with U.S. 84, which cuts across the state to the historic town of Natchez. More about Highway 45 and other Mississippi highways . . .
‹ Mount Vernons in Mississippi? these ‘highway stories’ are always interesting; thanks. had never noticed the split of highway 45 into state and national routes between shannon and brooksville; but, the state highway ’45-w’ designation would seem to be because the state route is geographically west of the us route, not because it goes west(for, of course, it goes north-south); in other places, i have seen this kind of thing called an ‘alternate’ route—’45-alt’. Somewhat interesting that this section of the Tourist Guide has gotten so little attention. Hardly a valid “survey”, but apparently not a lot of visitors to this website from east Mississippi. I know I’ve been on short sections of US 45 in my life, but the one memory that sticks in my mind was the trip from Meridian (actually Laurel) to Booneville as a teen in the 60’s via U-Haul truck. I can see Highway 45 Alternate from here(Crawford.) Within the last six months, a Rube Goldberg J-Curve redesign by MDOT was completed at this intersection to prevent deadly vehicle accidents. Several deaths from vehicle collisions have occurred since the 4-lane completion six years ago. In order to improve visibility at these intersections, trees are clear cut which only encourages outlaw motorists to increase speed and make a run for the intersection to beat the four-lane traffic. It has accomplished the goal of zero accidents so far. However, there is no lighting at the intersection and for the uninitiated this can cause driver panic. I like the Roundabouts, having been exposed to them while stationed overseas. I never saw an automobile accident at one. Even in Addis Ababa, where at that time the counter flow was clockwise I saw none. Maybe it’s because the Ethiopians in the Fiats were no match for deuce-and-a half Studebaker trucks. Expect to see more J-Curve intersections at a million dollars each. Something to pore over from Crawford in the deafening silence. Crawford was once known as the The Athens[Greece} of Southwest Lowndes County, and the birthplace of thePrairie Guards during the War.